Authenticity has been a constant watchword for Dan Cruickshank as he sets about renovating his Georgian townhouse. While Dan is well known as a TV presenter, the face of cerebral BBC documentaries such as Around the World in 80 Treasures and Adventures in Architecture, first and foremost he’s an academic: an architectural historian who is deeply passionate about the preservation of old houses that showcase the building styles of bygone eras. Find inspiration for your own renovation project with more of our stunning real home transformations. Read our guide on renovating a house, too, for more guidance. Two local builders, Mr Bunce and Mr Brown, built Dan’s four-storey home in Spitalfields in 1727 for a wealthy silk merchant. Dan bought it more than 30 years ago, and has been painstaking in keeping it faithful to the original spirit of the house ever since. 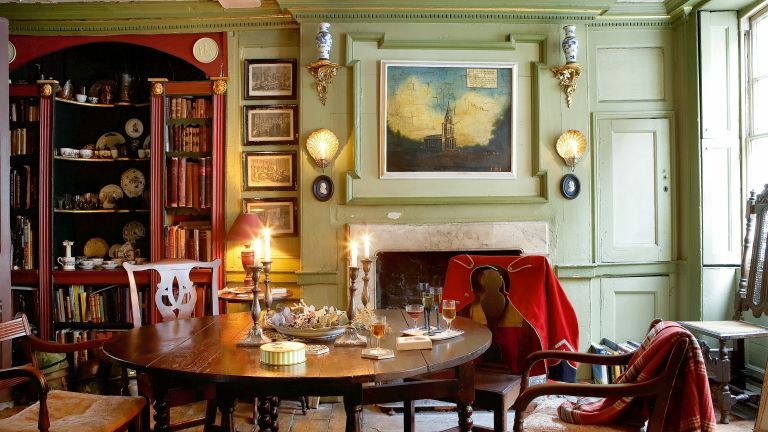 Swathed in 18th-century decorative detail and crammed with interesting – if occasionally rickety – antique furniture, the house is a gem of a time capsule. ‘I bought my house because I was intrigued by Georgian buildings,’ Dan explains. ‘The houses on this terrace weren’t built by great patrons of the arts as conscious works of art, just by humble builders trying to make some money; by chance, they have created buildings of great beauty. As he opened up the boarded windows he found, to his great delight, original 18th-century Crown glass – an early type of hand-blown window glass with a distinctive blue-green hue and rippled effect. ‘I find it incredible to think that during the Christmas of 1940, when the family that were living here were huddled in the basement and the east end of London was engulfed in a sea of flames, even the glass survived,’ Dan says. For tips on repairing a fireplace, have a read of our specialist guide. In addition to the period detail of the house, which Dan has restored as accurately as he can, he has chosen to furnish his home almost exclusively with antiques. Indeed, it is an Aladdin’s Cave of eye-catching, often rather eccentric historical artefacts. Adorning the walls are prints of architectural wonders, porcelain vases and oil paintings; and every room boasts quirky pieces that Dan has acquired on his globetrotting travels. His furniture has been sourced from junk shops and second-hand markets. Oak writing desks and coffee tables bestride Persian rugs, and high-backed 17th-century chairs are dotted around many rooms.